A ticket form is a set of predefined ticket fields for a specific support request. You can create multiple ticket forms. 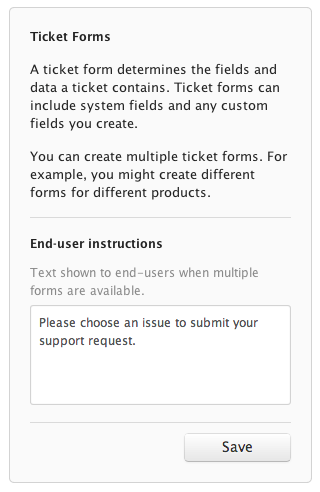 For more information about creating ticket forms, see Creating ticket forms to support multiple request types . When you have multiple ticket forms available to end-users, you can customize the instructions that end-users see asking users to select the appropriate support request form. A drop-down list of the available forms appears below the text. You can also change the order of the forms in the drop-down list. For more information, see Changing the order of your ticket forms . You can link directly to a ticket form in your Help Center if you want to present a group of end-users with a specific request form instead of asking them to select the appropriate form. Note: Ticket forms are available to end-users on your mobile site if you are using Help Center. Ticket forms are not available to end-users on your mobile site if you are using Web portal. Click the Admin icon ( ) in the sidebar, then select Ticket forms . Enter text in the End-user instructions box on the right. You can use dynamic content in your end-user instructions. For more information see Creating dynamic content . 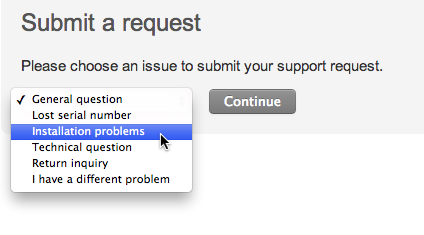 Go to your support request form on your site, select a form from the drop-down list, then copy the URL. Present the link to customers so that they can open a specific request form in your Help Center. Hi, I've been chatting with your very helpful tech support about this issue and they suggested I post to this thread. Similar to Shannon Brown (earlier in thread), we are implementing Zendesk as an internal tool, rather than an externally facing tool. As such, it will be used by all of our employees to request support from IT, Facilities, Employee Education and other departments. In this scenario, Zendesk agents (who are part of IT) are also Help Center customers and may need to request support from one of these other groups (or from another area of IT). Currently, these agent/users are unable to open requests through the Help Center, as all "new_request" links take them directly to the ticketing dashboard (not the best end-user experience). To support customers in similar environments, I would like to suggest adding functionality to allow those configuring Zendesk to determine if and who should be redirected when clicking on a "new_request" link. This would enable your product to more smoothly transition from being an eternally facing support tool, to being a multi-functional tool for internal and external support. Thanks so much for the detailed feedback! I'm sorry to have to re-direct you on this one, but we do have an active thread about this in our Product Feedback forum. Our Product Managers hang out there so they'll definitely see your use case; in point of fact, one of our PMs has been active in the thread already. Another member of the Community also posted a workaround there that you might be interested in looking into. You can find the thread here: Add Submit A Request for Agents. I want to change the instruction on the ticket form. I don't see the option "Ticket forms" in my Admin (yes, I'm administrator). Can you help me how to get to the ticket forms admin? An important thing to note is that the ability to manipulate Ticket Forms is an added feature on a Professional Plan so if you have not purchased The Productivity Pack then this feature would not appear in your account. This is the most likely reason that you do not see this option in your accounts. If you're interested in adding it you can contact your account manager and i'm sure they'd be happy to assist. We are getting started with custom forms and appear to be missing some basic step to see the form via URL. But I can't seem to find the correct form id. Hovering over the form name, as suggested, doesn't show any info. If I inspect the page elements and use this value [data-form-id="753248"] the page just redirects to our /agent/ home page. Is there a post somewhere with clearer instructions for getting started? I also was unable to generate that link by hovering over different Forms, so I'll pass that along to out Documentation team. If you have any questions, or want to look at specific examples in your account, let us know and we can create a ticket! Any tips to get the form to show within an article on Help Center? We have the productivity pack and use forms within our web widget, but would like to add / embed a couple forms within specific help center articles. I have generated the link based on Daniel's comment above, but adding it to the article does nothing. The instructions above will only give you a link your users have to click, which will take them to that form. It won't actually embed the full form. My knee-jerk reaction is that it's not possible to embed a form in the body of an article, but I'm double-checking on that to make sure I'm not missing the mark. Stand by! My initial thought was right - it's not possible to embed a Guide form into the body of an article. There are other form services that will give you embed code, though, so you might be able to take advantage of that. It won't be your own form, but you may be able to recreate something that looks very similar and still have it create tickets in your Zendesk. I'm trying to add a link to a specific form in an article. I tried all of instructions to get the URL but none of them seem to work. According to the article plus Daniel's instructions - the URL should be [mycompanyname].zendesk.com/hc/en-us/requests/new?ticket_form_id=[ID]. Any ideas on why this link is not working? Since no one from the community has been able to answer your question, I've asked one of our Customer Advocates to take a look and see if they can help you out. Someone should be along shortly. In the meantime, I see that this is your first post - I encourage you to head over to the Welcome Thread in The Lounge to introduce yourself. Thanks Nicole. I actually figured it out by playing around with it. I used "hc/en-us/requests/new?ticket_form_id=[ID]" and it works. Great, glad to hear you got it sorted, Mary! I need to update the URL that the Submit a Ticket option, located in the Help Center, points to. How do I do this? I don't see any options in Guide Admin in either ZD Support or Guide. While I do see class info in the home_page template (and, in the .css file, two .css styles controlling the look, but not the location), there is no discrete URL as part of the home page. Does anyone know where (and how) to update the Submit a ticket button's URL in Help Center? I'm pretty sure you can customize this in the HTML code for header, but I'm going to do a sanity check with some of our Community Moderators because I'm not 100% certain what can be changed in CSS and what can't. Stand by! Now you can change the URL to whatever you need it to be. Do I need to have the Help Center activated in order for this link to work? Welcome to the Community, Delina! Yes, in order for your end users to be able to see anything in your Help Center, it must be active and visible to the public. This is what I can see from the Ticket Form screen. Where is the Ticket ID or Ticket Form Name here? The ticket ID is automatic and is included. The ticket form names are not showing for you because it seems your account plan only allows one. What is it you want to do? I want to present the ticket form to end-users. I don't get the "once a ticket is created". I am assuming that before a ticket is created, the end-user should be submitting the request via the ticket form (submit request). You're correct. I guess I'm wondering why you're looking for the Ticket Id field on the form since it doesnt exist when they are submitting the request... Sorry! Because the article says that's how I can present the form to the end-user so they can go to that link and fill it in? So going back to my original question, after I created the ticket fields, how can I present the ticket form to the end-user? how and where can I get that link? You can find the URL for a specific ticket for by going (in an incognito window) to your Submit a Request page and select the ticket form from the dropdown list. Then just copy/paste the URL from the address bar. I am unable to do this. Can you please show how can it be done for the instance sovcustomerservice? So it looks like you've completed your ticket form and you'd like to be sure it is being presented to the customer, is that correct? An end user can get there either by going directly to that link or landing on your Guide page and clicking "submit a request". If that page does not appear or it requests a signin, you may want to ask support@zendesk.com to help. Open an incognito window in your web browser and navigate to sovcustomerservice.zendesk.com. Do NOT log in. Click on Submit A Request in the upper right corner. This will take you to your ticket request page. Since you have multiple forms, the first thing you'll see is a drop-down listing all the available forms. Select the desired form. The form you selected will appear on your screen. Copy/paste the URL of the form from the address bar in your browser.